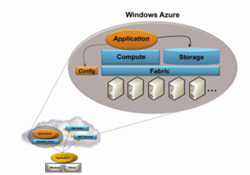 Microsoft Windows Azure is an enterprise grade platform offering Software as a Service (SaaS) in cloud computing. 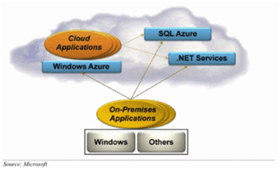 It offers cloud and a development service to build applications that covers end-to-end web and enterprise scenarios. Microsoft, after talking about it endlessly, has finally opened up its cloud platform, Windows Azure, for business. Windows Azure and SQL Azure are now available in 21 countries worldwide, the company said. So today the rubber meets the road — and we get to see how Azure does in the marketplace. What will Azure’s financial impact be? It’s hard to say, but I think it’s safe to assume that Microsoft, which has gotten used to the 50 percent (or higher) margins on its products, will see those margins shrivel in the face of the competition. Azure is joining a crowded marketplace, one dominated by Amazon and its web services, which now boasts of thousands of developers in addition to an entire ecosystem. And if that wasn’t enough, Azure will be competing with offerings from IBM, Cisco Systems, EMC Corp. and VMware, Rackspace and other small players. Microsoft says it’s not worried, though and claims companies like 3M and GXS are already using the Azure cloud. Notably, Microsoft’s Azure is part of Redmond’s “software-plus-services” strategy that also includes its Hyper-V server virtualization platform launched in October 2009. Microsoft also sells Windows Live, Microsoft Office Live, Business Productivity Online Suite, and Microsoft Dynamics CRM as SaaS, making it part of the company’s larger cloud strategy. Given how closely we at SSS have followed the Azure saga, I thought it would be good to highlight some of our past coverage containing relevant details about Azure and Microsoft’s plans. Windows Azure is a cloud operating system on which developers can build using .NET, Java, Ruby on Rails, Python and other languages. (From Everything You Need to Know about Microsoft’s Azure).